From a rational perspective, we should only make decisions that are in our best interest. And yet we don’t. From procrastination to revenge to emotional outbursts, many of our actions are highly irrational. And according to Dan Ariely, a behavioural economist who has made a career out of figuring out the hidden forces that shape our decisions, there are important psychological reasons for this. The Upside of Irrationality is an attempt to capture the complexity of our irrationalities—the parts we would rather live without and those we would want to keep if we were the designers of human nature. For most people, the word “irrationality” has a negative connotation; for Ariely, it signals a place of interest, a starting point that usually leads to revelations about human behaviour. In fact, each chapter is based on experiments he carried out over his long career. With the advantage of hindsight, Ariely has acquired some intriguing insights that have implications for life, business and public policy. Many seem counter-intuitive. For example, large bonuses make CEOs less productive. We often seek justice no matter how extreme the consequences. And, as a business model, online dating, despite its popularity, is a social marketing failure. There are fascinating explanations for this and many other areas of human behaviour. Ariely is an engaging writer, generous with both his subjects and his colleagues. Most of all, his anecdotes are highly interesting. He seems to feel, however, that he must make an over-all case for how being aware of these hidden forces can lead to better decision-making and happier lives. This isn’t necessary. His stories about why we do what we do are fascinating enough. 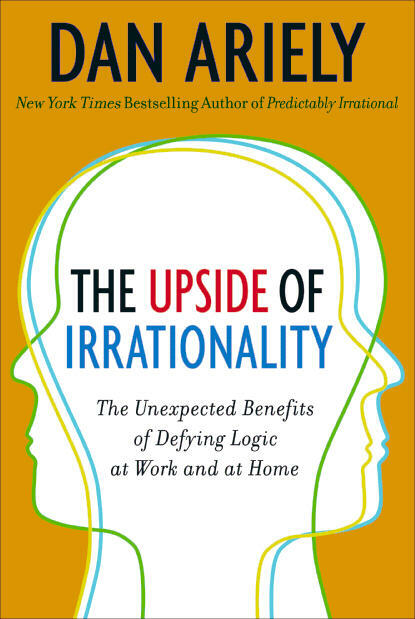 The Upside of Irrationality, Dan Ariely, HarperCollins Publishers. Review first published in the Courier-Mail in July 2010. Thanks, your website is full of interesting stuff! I have a blog on blogspot, I like it because you can change blogger templates really easily without understanding any HTML. Anyway, just thought I’d say hi, and keep up the good work.